Don’t get me wrong, Firewire is great. But just like anything in life there are things that drive me absolutely batty when using Firewire on set. I’ve replaced my colleague, Ryan Kahm, on the set of Blue Potato here in northern Maine as DIT only to find, and tackle, two annoyances with Firewire. I’m working on set with my MacBook Pro connected to a 4tb G-Raid and 1.5tb G-Raid Mini, the latter acting as a “shuttle drive” to and from our assistant editor and his set of G-Raid archive drives. My first day on set I begin downloading a SxS card from our Arri Alexa to the drives, only to have the G-Raid randomly eject. I checked and switched Firewire cables and power adapters with no avail. I hung my head in defeat, resigning the drive to having a bad Firewire connection, and hooked it up via USB which solved the issue. We returned to our crew dorms where I troubleshot the issue further. If I hooked the G-Raid Mini in the daisy chain first, before the main G-Raid, it fixed the problem magically. Research revealed it’s a notorious issue with G-Raid drives, to the point where it’s near impossible to hook two normal G-Raid drives to the same system with a Firewire cable. Sometimes it’s good to keep USB cables around. Working on location lends itself to the inventive use of workspaces: from the inside of vans to the dining room of a fast food joint. It also means less than ideal working conditions. The Firewire end is bigger and heavier than USB, and far more fragile when it comes to a table bump or cable tug. The beauty of paper tape. Excuse my dirty, film making, fingernail. 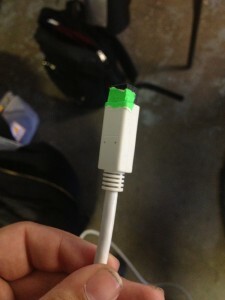 I’ve gotten into the habit of wrapping my cable ends in a layer of paper tape to tension the Firewire connection. It’s stronger, more robust, and generally less headache inducing. If the plug is too snug, you can also run paper tape over just the bottom and sides of the plug. Figuring out both issues over the last few days, however, has been rewarding. How have you solved on set annoyances? Share your stories in the comments below.